In the conditions of rapidly developing technology and extremely swift pace of life, we’ve used to getting utterly convenient services and branded clothes and things right at the moment when the wish was made. On the whole we’ve forgotten about simple pleasures like handicraft. One may object that he has a costly handmade clock or a tunic from a well-known designer. But it just confirms the statement, and now handicraft is utmostly for kids and the tradition to wear handmade clothes or decorate one’s home with handmade design items is not the trend. Dan Shapiro, Glowforge’s CEO, believes that with the new laser technology Glowforge 3D printer love for handmade things will restore. Comparing with other 3D printers, the Glowforge doesn’t use an additive process and doesn’t create objects out of paste or liquid that solidifies. The main point of the new technology is in the following: it precisely cuts or embosses materials, which can then be put together to create something. The printer has a concentrated laser, which emits a beam about the width of a human hair and cuts through any organic material. The machine reminds a large scanner, and it works in a similar fashion. It scans the material put inside the printer bed, while you choose what you want to print, and then Glowforge’s accompanying app gives a countdown on how long the item will take to print. A user can draw designs right on a piece of material, and the printer will cut around the lines; the design can be downloaded through Glowforge’s app, or one can use pretty much any design file from Photoshop, Adobe Illustrator or any 3D modeling software to create more intricate designs. The wood items already made on the Glowforge include a mahogany computer stand, a keyboard holder and drone’s body. The printer can also engrave stone and metal, and cut denim and alike cloths. 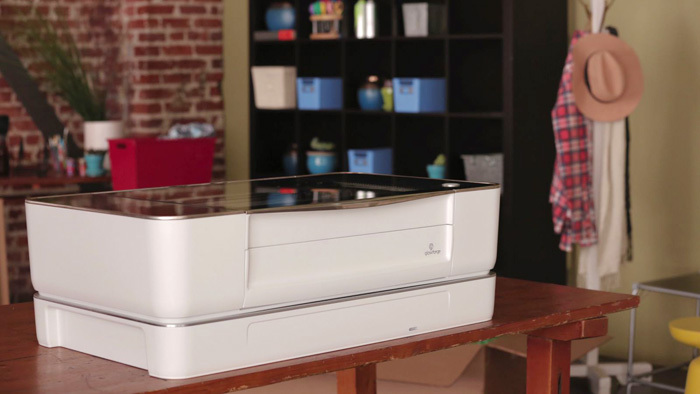 The printer is available for preorder at $1,995, but will cost $3,995 when it goes on general sale. According to the producer, the printer can finally bring 3D printing into the average consumer’s home. This entry was posted on Tuesday, September 15th, 2015 at 8:32 am	and is filed under 3D, printing. "Epson Large Format Printers with Violet Ink"